An Escapologist’s Diary: Part 32. Unquiet Revolution. Every evening this week at 8pm, we’ve taken saucepans and kitchen utensils onto the balcony and made a racket. Odd behaviour, I know, but we’re not alone. For twenty minutes each night, residents of Montreal make as much noise as possible. Those at home rattle their pans, motorists sound their horns, pedestrians cheer and shout and whistle. The symphony is heard across the city and everyone knows what it means. Things are getting exciting here. As I type this, the apartment is filled with the sound of revolution: joyous pan-rattling from rooftops and balconies, shouting in the streets; urgent sirens and helicopters. Thousands take to the streets each night, waving red flags and chanting en Français. It all started with campus-based student demonstrations opposing a $1,625 increase in tuition fees. But when the Quebec National Assembly attempted to quash the protests by initiating an emergency law called Bill 78 on May 18th, it somewhat fanned the flames. It’s not just students anymore. The protest crowds and the saucepan-bangers are from all walks of life. People won’t tolerate such brutal top-down interference in what we’re allowed to do. Whether or not you disapprove of the fee increase, you probably feel that citizens have the right to peaceful protest. On the street, people register their approval of the protests by wearing red squares of cloth pinned to their clothes. As the protests continue and the issues mature, more and more of these red patches appear. What was originally a student meme is now a mainstream gesture of mass objection. Statistics suggest that the majority of the public are not yet behind the protest (irritated as they are by the resulting traffic jams and metro closures) but the racket of the pans each night suggests that a large number of people support it. A single street protest last weekend was apparently largest act of civil disobedience in Canadian history. 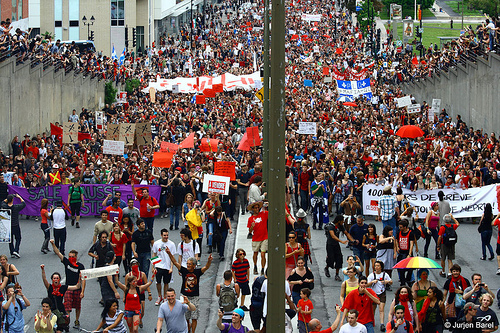 Tuition fees were the initial thrust of the protests, and residential disapproval of Bill 78 is a catalyst, but banners carried by the crowds suggest a wider dissatisfaction with the current government and capitalism at large. Many see the hiked tuition fees as symptomatic of the political corruption and gross financial mismanagement of the last few years. Since the 1960s, people have worked hard to guarantee a certain standard of public service and accessible education to help ensure a decent quality of life for all. It is a shame to let all of that disappear now. Hundreds of thousands of street protesters marched past our Park Avenue apartment building last night, proudly flouting the demands of the emergency law. Hundreds will have been arrested. Montreal’s mayor, says “we need to reclaim our streets” as if the protesters were a pesky minority and that he somehow stands with “us” against “them”. But the divide is not between miscreant protesters and right-thinking citizens. The divide is between residents and government. Welcome to the seventh New Escapologist occasional newsletter. I’ve been plugging this offer a fair bit lately, especially to the readers of our blog. Sorry about that. But it’s a good deal for you and actually generates a bit of money for us. Besides, a complete collection of New Escapologists on your shelf will astound your friends and crush your enemies (should the shelf give way and collapse upon them). Take advantage of this great offer at our here. We’ll be at the Montreal Anarchist Bookfair on 19th-20th May 2012. Rather alarmingly, this will be our third visit. Do come along to say hello (and stock up on New Escapologist goodies) if you’re in the locale. Much later in the year, we also hope to be at the London Anarchist Bookfair in October 2012. You Are Nothing. It would make a great title for a self-help book, eh? Alas, it’s nothing to do with Escapology, it’s a book about comedy written by New Escapologist‘s editor Robert Wringham. 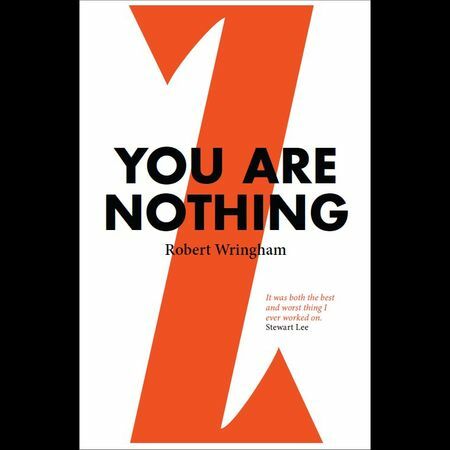 It’s an exciting non-fiction volume about Cluub Zarathustra: a viciously inventive but sadly forgotten cabaret show featuring Stewart Lee, Simon Munnery, Roger Mann, Kevin Eldon, Richard Herring, and many others. The book is based upon new interviews with the main cast, various supporting artists, critics, and members of the audience. The book is published by Go Faster Stripe and is available here. A lot of people have asked about digital editions of New Escapologist. It’s something I’ve always been reluctant to do: craftsmanship and getting away from computer screens are things we’re keen to promote. But are these goals too lofty? Too silly? Too reactionary? It seems there is a real desire for New Escapologist in PDF format and for download to the various Kindle and iPad-type devices, and we’re not completely immune to peer pressure or market forces. How do people feel about digital editions? Please get in touch by replying to this email if you feel strongly in favour or strongly against. “Thank you for the work you’re doing. I’m currently very far from the lifestyles you depict in your magazine, being an armed forces officer working in NATO, but your accounts of escape paths definitely triggered something in me and gave me sense I was not alone feeling this way and that it’s actually possible/feasible to live another life and to say ‘Goodbye to all that’.” – G, Europe. “NE didn’t change my life but it would have if only I’d have found it sooner. Now it’s like a great companion.” – Anonymous, via the reader survey. “All my back issues are by the toilet (pride of place you understand) and have been complimented more than once by people making use of the facilities!” – Mark, Leicester. Issue 7 is now in production. The theme, broader than usual, is “On the Lam” and attempts to bottle the excillerating feeling of an escape in action. As ever, you can subscribe to our free blog by RSS. 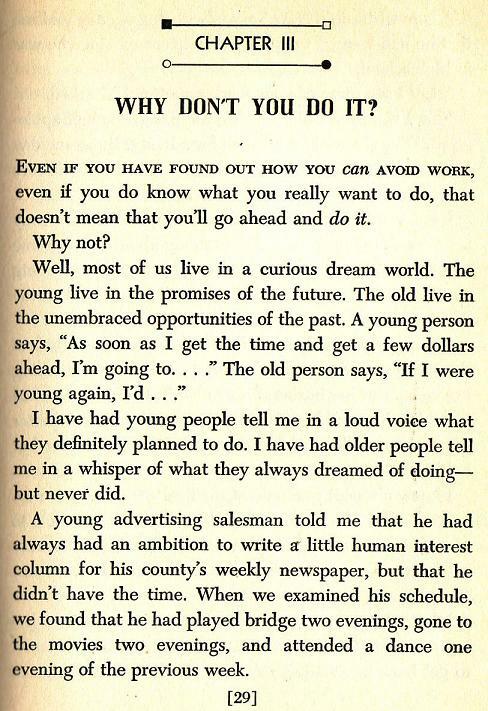 Good recent blog entries include a review and scanned sample of a 1949 book called How To Avoid Work; a Will Self-inspired discussion about the politics of walking; a reflection upon things of true value in a pleasant life. 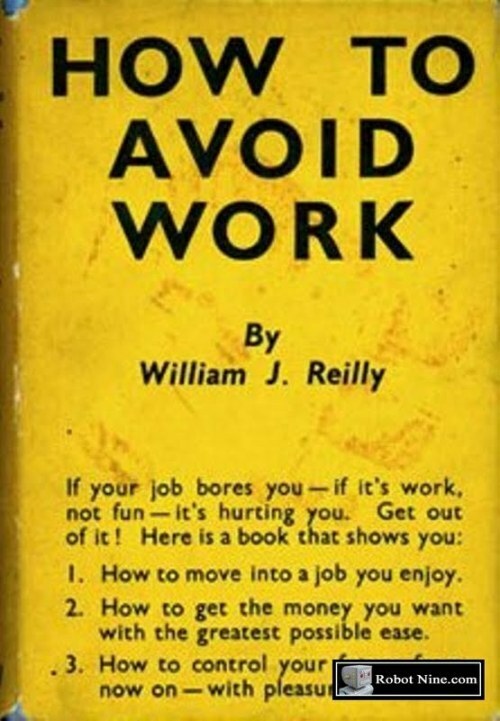 We discovered a 1949 book called How To Avoid Work when my girlfriend found a postcard reproduction of its dust cover for sale in the British Library gift shop. The book is out of print and usually costs a fortune but we were lucky enough to find a copy on Etsy for a tenner. The book is terse, austere, and thanks to the passage of time, somewhat quaint. It’s basically a career guidance book with the central message that “work” can be avoided if we think carefully about the kind of job we really want. It’s a bit of a rip-off in that you’ll still have a career and a daily job if you follow this advice, but there’s wisdom in the notion that we don’t have to do work that contradicts our values or wastes our true talents. Much of the book is too old-fashioned to still be applicable: there’s a funny chapter about ‘sponsorship’ – a method of landing a corporate job by means of informal schmoozing. There’s also an old-fashioned and hectoring lingo, and a strong assumption that the career-minded reader has external genitalia. But there’s one interesting chapter called “Why don’t you do it?” which is ostensibly about New Escapologist‘s favourite subject: Bad Faith. It asks why so many people do things they don’t want to do (and fail to do the things they truly want to do). Here’s a little sample. You’ll probably agree that it still holds water. When I quit my modestly paid day job, I felt very proud to have acted according to my will and to no other. But I was secretly scared of what would happen next. Would I end up destitute? Would I have to do things even worse than clerical work in order to avoid destitution? Three years later, I’m still living on the money I saved from that job, supplemented by an income so small that most people (including those people who work at the tax office) consider negligible. They consider it negligible because they are addicted to a consumer lifestyle – the mild and dim lifestyle shown to us in magazines and on the television. I am not a hermit or a monk or a dreadlocked radical. I did not “escape to the countryside” or go “back to the land” and I do not live in a squat. I live in a nice little apartment in the fashionable part of a civilised metropolis. I do not live in fear of what will happen next. I do not do work that I find undignified. I do not wait on tenterhooks for pay cheques. I don’t have all the answers and I have no personal investment in whether people choose to continue on the usual treadmill or to escape it. But to those people who aren’t having a good time and aren’t too proud to take some advice from someone who doesn’t mind looking bit arrogant: try doing what I do. Admirers of the editor (and comedy fans alike) might like to hear about my first book, published last week by comedy media octopus, Go Faster Stripe. 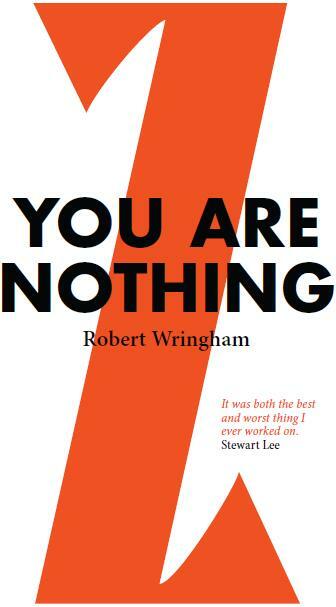 The book is called You Are Nothing and (far from being a self-help book with a title like that) is an “unreliable history” of the avant-garde early work of super-comedians Stewart Lee, Roger Mann, Simon Munnery, and their amazing friends. I’ve loved Go Faster Stripe since they were formed in 2005 and I’m profoundly happy to have produced something with them. Properly against the grain in style and in subject, You Are Nothing was a thrill to write and will be thrice as thrilling to read (lest my eyes be plucked from their sockets by a tribe of the commonest wooodland mammals). Read more about the book (and place your order if you like the sound of it) here. I really can’t get enough of Dear Jeremy, the career advice column in The Guardian. Reading about other people’s work problems (from petty office politics to tedious career choices) is a good way to remember the Great Terror from which I narrowly escaped. It can only keep me on my toes, eh? This week’s column features a most escapological conundrum. A fellow wants to escape his day job with £350,000 of assets. He plans to invest it in a new business of his own devising: a bed-and-breakfast hotel. To have raised such a handsome battery of wealth (and presumably to be debt-free) seems to be a case of “mission accomplished” to me. I certainly wouldn’t invest it in such a financially risky and time- and energy-consuming endeavor as a B&B. Hasn’t he seen Fawlty Towers? Out of the frying pan and into the fire. I suppose it depends on his overheads: the affluent consumer lifestyle is an expensive commitment. I’d just curb my consumer desires, retire at once, and spend the money slowly on top-notch cakes for the next fifty years. What things are required for a pleasant life? Here are my answers. Not many of these things are commercially available. This is not an attempt at fabricating a mawkish, real-meaning-of-Christmas-style consolation prize. This is what I’ve found, so far, to be true. We use Escapology as a metaphor. You probably already knew that. Where Houdini applied his intellect, physical prowess, and showman pizzazz to escape handcuffs and water chambers; we learn to do the same for traps like financial debt, poor schooling, boring day jobs, unsatisfying materialism, commercial dependence, tedious monogamy, and urban lethargy. I just learned about something called barn raising. You probably knew about that too, but I’m such a city slicker and historical ignoramus that I’d never heard of it before. It strikes me as a great metaphor for collaboration. If everyone chips in, these big, difficult, potentially expensive things just happen. And later, you can take the opportunity of being together to all get drunk and dance. I suppose it’s like what Vonnegut used to say about the advantages of extended families. Maybe there should be a metaphorical barn raising internet community. 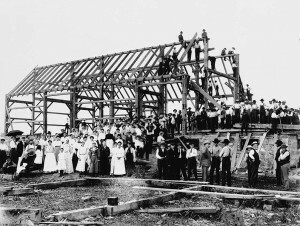 Twenty people join the community (or a sub-group of that community) and they all pledge their barn raising services to the group. Everyone must chip in to help with a sizable project initiated by one member of the group. If Fred wants a to lay a patio at his house, everybody comes along and makes the project happen over a pre-planned period of time. If Marge wants to assassinate a major world leader, they all club to together Julius-Caesar style. (I’m just kidding about the assassination, but you get the picture). It could be destined to failure. Would there be too many freeloaders? Would there be an imbalance in individuals’ skills? I can typeset a book for you, but I’m not the greatest when it comes to damp-proofing a cellar. Food for thought though. An attempt at loosely-organised, mutually-beneficial cooperation in the fashion of barn-raising could be a viable alternative to the usual solution of throwing money at a project and hoping it goes away.